You could be putting your health at risk! Or at least...the health of your private parts. Thinking about skipping a shower for another day? You won't after reading this. Summer is about to get even better. Wait until you read what ladies did during that time of the month. You'd think that there are only so many ways to use shower curtain rods, but these people are coming up with truly ingenious inventions! The more you know...the less you'll want to go. Hope you have some TP handy. Are you overusing your loofahs? Leaving them to hang in the shower after you turn the water off? Well stop! Now! Because not only do those rough sponges hold onto germs like babies, their exfoliating qualities also lacerate and tear at your skin, whose pores are already relaxed from all the steam heat, making germ entry even more possible. Make sure to trade out your loofah on the reg, and to take it out of the shower and dry it off when you're done. If you leave it in while wet, it can attract a whole mess of germs. Girl, I know. Who doesn't like exiting a shower looking like they just stood next to an open flame for a weekend, am I right? Problem is: taking a piping hot shower can strip the skin of its natural oils, leaving it dried out and all kinds of nutrient deficient. So keep that temp tepid. ...Or at least the shower. Lightning storms can pose a hazard to those looking to get clean. That's because when lightning strikes, it can travel through water. Water like the water in your pipes. Water like the water that comes through your pipes and into your bath or shower. So maybe...wait. Make sure, when you use shampoo, that your hair is fully wet. Don't go squirting that stuff on your scalp when your hairs are just semi-wet. If you do that, the shampoo won't fully lather, and you'll overuse the shampoo — and might dry out your scalp. Do you attack your skin with the towel like a prizefighter with the right hook? Well don't do that. You can tear and damage your delicate skin, causing dehydration, chapping, and other skin disorders. In the words of Samuel L. Jackson in Pulp Fiction, you blot that s**t.
If you shampoo every time you take a shower, well, you're shampooing too much. Short and simple. You don't want to dry out your hair! Those with fine, delicate hair can shampoo up to twice a week. Those with coarse and curly hair: bump it down to once. You'll save so much money on product! The answer is probably yes. Staying in the shower for too long can irritate your skin, making it dry and itchy. Keep your showers down to at most once a day. And limit them to no more than eight minutes at a time. But don't scrub too quickly, otherwise you can slip and bump your head. OK. You're getting a mani-pedi later today. You want to make sure your ankle hair isn't curling up in front of the girls at the salon. So you shave your gams. But you shouldn't. Why? Because that can increase the risk of infection. Not all salons are up to code, and your hair follicles are meant to catch germs before they enter the skin. So keep those bad boys long and strong to defend against invaders! 9. Off With Their Shower Heads! 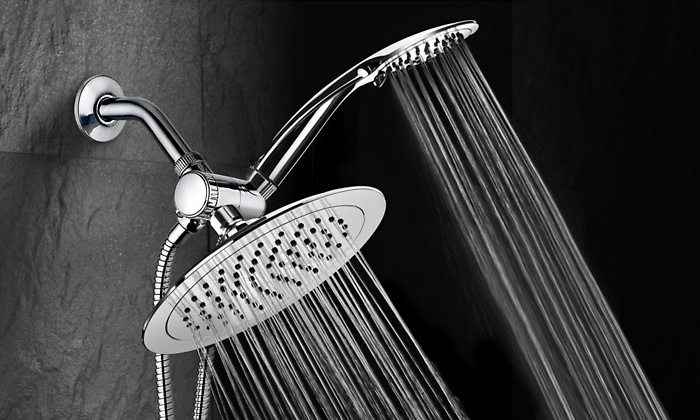 Your shower head could be your worst enemy. Those pores can harbor bacteria that spew onto your scalp and body when you're taking a shower. The high-flow shower heads are the worst. Consider a rain-type shower head, or just scrap the whole whatchamacallit and receive the full quantity of water right from the spout — unimpeded. We all want to wear the crown. But are we going to get it greasy and oily? That's what will happen if we condition our hair above the crown line. We can prompt the production of unnecessary oils and greases. Rather, we should restrict our condition-usage to the roots first, and keep it at that. That way we don't shine up that tiara we know we should be wearing forever and always. If you're not showering without a bath mat inside and outside the shower, you're setting yourself up for disaster. In 2011, the Center for Disease Control and Prevention estimated that 230,000 accidental injuries happened in the shower and/or the bathroom proper, many of which involved slipping and flailing, which could have been prevented by that tight gripping mat. It's so handy for your feet. Speaking of shower injuries, oils are one thing you might want to avoid. They might feel great, smell nice, do all the good things to your naked bod. But they can also kill. Well, not directly, but they can make the floor and walls dangerously slippery. Swap that stuff out, and stay upright. Showering at night can be a glorious thing, especially if it's super hot out and you need something to cool down your bod before bed. But...don't. Or at least give yourself two hours before your scrub down and your beddy-bye time. If you don't, the temperature differential so soon before bed can offset up your body's natural rhythm, making it harder to fall asleep. If you're like many people who are hasty in the show-show, you can often leave soap suds on your body when you finish a shower. Well, you shouldn't. Many of the cleansers we use are chockfull of chemicals and toxins that, when left on our skin, can cause all kinds of irritation. Make sure that before you step out of that steamy chamber. That, or use low-irritant, less effective, cleansers, and be nice to your skin. Lastly, and perhaps most importantly, don't kill people in the shower. It might look great in the movies, but in real life...it's illegal. It also creates a heaping mess that you probably don't want to have to deal with. So let them enjoy their oil-less, lukewarm wash down without imposition and interruption. Who knows...they might even ask you to join.